Travis Perkins has announced today that following a rigorous and wide-ranging selection process John Carter will step down as CEO and from the Travis Perkins Board on August 5 2019. He will be succeeded as CEO by Nick Roberts, currently CEO of Atkins (formerly the business of WS Atkins plc). Mr Roberts will join the business as a director of Travis Perkins and CEO designate on July 1 2019. To ensure a smooth handover, Mr Carter will remain with the Group until the end of 2019. 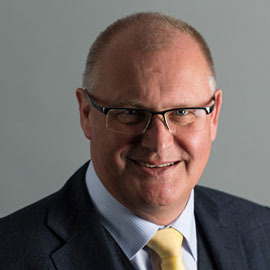 Stuart Chambers, chairman of Travis Perkins commented: "On behalf of the Board I would like to thank John for his exceptional leadership which leaves Travis Perkins well placed to meet its customers' needs and to continue to deliver long term value growth for its shareholders and other stakeholders. John has given over 40 years of dedicated service to Travis Perkins, serving as a Director for 18 years and as CEO for the last 5 years, substantially improving the business during his tenure as CEO. He has led the Group through periods of major change and demonstrated strong leadership during a period of significant investment and considerable market uncertainty. He has been the architect of the strategy to reshape the Group, refocusing on delivering best-in-class service to our trade customers and simplifying the Group, including the planned sale of the Plumbing & Heating business after its successful transformation. John will leave as his legacy a strong trade focused business of great integrity with well-established inclusive values and an accomplished management team which is well-placed to deliver the Group's strategy. We are delighted to announce Nick's appointment. Nick joins us from his role as CEO of Atkins where he has been running a significant relationship-led global engineering, design and project management business. Nick has the breadth of skills needed to grow the business and to build on the strategy outlined in December. He has deep experience of the construction, design and engineering industries; which coupled with his successes in the adoption of digital, will prove invaluable in driving the Group's strategy into the future." John Carter commented: "I have invested my working life with Travis Perkins and I am exceptionally proud to have spent the last 5 years leading the business as CEO. It has been a privilege to lead such a great company which has been built and sustained by the efforts of colleagues right across the Group. Although it is early days, I am pleased that the new strategy which we set out in 2018 is being successfully implemented and I look forward to working with Nick to build on this momentum and ensure sustained progress towards the Group's longer term strategic goals. I will leave in place a very talented and experienced leadership team who collectively have over 200 years' experience of merchanting and are focused on delivering excellent service to our core trade customers." Nick Roberts said of his appointment: "I am delighted to be appointed as Travis Perkins' next CEO and am looking forward to leading a great business full of talented and dedicated colleagues. Customer expectations and sales channels are evolving rapidly, and I am excited at the opportunity to bring my experience together with that of the Group's management and to build upon the strong foundation that John has put in place. Our focus will remain on best serving our trade customers and building long term sustainable value for all of the Group's stakeholders. I would like to commend John for the remarkable leadership he has shown as CEO and I am looking forward to working closely with him during the transition."